A brilliant autobiographical graphic novel, it is a fabulous book for Stage 4. It would work brilliantly for representing the self, narrative voice, representation and intercultural understanding. 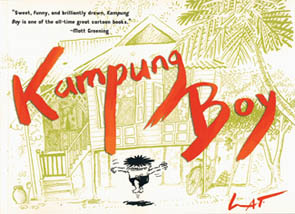 Kids just love Kampung Boy. Our book trailer for it has now passed a monstrous 166,000 views on YouTube! NSW teachers and students need their DEC User ID and password to access the newsletter.